IT Sector in India is not growing at the hectic pace that it did in the previous decade, but it has still been registering a decent growth in past couple of years. However, this growth is not translating into job creation, if the reports are to go by. 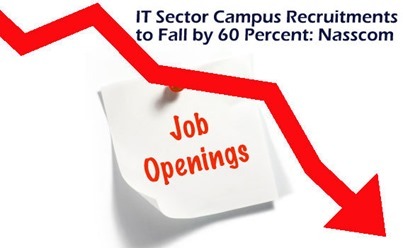 According to Nasscom, the IT sectors jobs will not witness any growth compared to last year, they will actually fall by around 17 percent in 2013. According to Nasscom president Som Mittal, last year 180,000 new jobs were created and he expects that number to be between 150k to 180k this year. The reason for fall is interestingly not linked to IT sector growth, but due to the fact that non-linear and lower-end jobs are getting automated. The IT industry requirement are changing, and they now need more domain experts. Another aspect is, IT sector attrition levels, which have been consistently averaging around 20 percent have fallen to 14 – 15 percent. These report of fall in job numbers is in sharp contrast to what Infosys had announced earlier in the year. They had mentioned that 2013 will witness higher job creation than previous year. According to them, 2,50,000 new jobs were expected to be created in IT sector. Nasscom’s estimate of 1,50,000 is far lower than that. The biggest effect of fall in lower end job openings is going to directly hit campus recruitments. According to Mittal, Campus hiring may come down by as much as 60 percent. He also added that three years back, 80 percent of entry level recruitments happened with focus on technical skills, but now companies focus is only 40 percent. Rest of the focus is now shifted to soft skills and domain expertise.